Merry Christmas to all! I just wanted to share one last Christmas story with you for this year. I will warn you that it lasts for a bit, but it’s a Christmas classic! It also answers the question of what happens when you turn a Venturer Company loose with a video camera (just in case you were wondering). I am pleased to say that I have the chance to work with some of these youth on a regular basis, and they are among the most talented Scouting youth I’ve ever had the pleasure to work with. One month today is Christmas. While many would say it’s far to soon for Christmas stories, I wanted to share this one with all of you. I have seen several variations of this tale, and my hand has added a little to this version as well, but I can find no definitive source to credit an author. So like the Christmas Scout, he or she remains unnamed but I am thankful for the story and it’s meaning! This is the legend of the Christmas Scout. It was told to me first by a small boy, whose faith in the story was absolute. He even showed me a toy airplane and said emphatically that it came from the Christmas Scout himself. A young man was returning home from his family’s traditional Christmas Eve reunion with relatives for the purpose of exchanging gifts and good wishes. He now had a sled full of presents and although it was cold, he was warm because he was wearing the new ski jacket for which he had hoped. It was his favorite gift. But in spite of everything he was not happy. This was because it was to be his first Christmas without his brother who had during the year been killed by a reckless driver. His brother had been a good Scout and a fine example to him. The holidays were a painful reminder of how much he truly missed him. Near the end of the evening the young man had said his thanks and good-byes to his relatives, then explained to his parents that he was leaving a little early to stop and see a friend on the way. Afterwards he would meet them at home. Now as he walked through the cold night air he hoped to find the patrol leader of his Boy Scout Troop. Perhaps he might have some advice to offer the young Scout. Though rich in wisdom, the patrol leader lived in the “Flats” a section of town where most of the poor lived. Arriving at the patrol leader’s house he was disappointed to find his friend was not at home, so disheartened he turned to leave. As his hiked down the street toward home, he caught glimpses of trees and decorations in many of the small houses. Then, through one front window, he glimpsed a shabby room with limp stockings hanging over an empty fireplace. A woman was seated nearby . . . weeping. The stockings reminded him of the way he and his brother had always hung theirs side by side and how the next morning, they would be bursting with presents. A sudden thought struck him: he had not done his ‘good deed’ for the day. She took some candies and a game, the toy airplane, and a puzzle. When she took the new official Scout flashlight the young man almost cried out, but he did not. Soon he saw that the stockings were full and turned to leave. “Won’t you tell me your name?” she asked. The visit left the Scout touched with an unexpected flicker of joy in his heart. He now understood that his sorrow was not the only sorrow in the world. Before he left the Flats that night he visited many more homes and gave away the rest of his gifts. The last one being his new ski jacket which had gone to a shivering boy who had none. Now the Scout trudged homeward, cold and uneasy. How could he explain to his parents that he had given his gifts away? ‘Where are your presents, son?’ asked his father as he entered the house. ‘I was very happy,’ he answered quietly. The young Scout had no answer. With his brother gone, and his family disappointed in him, he suddenly felt dreadfully alone. He had not expected a reward for his generosity; for he knew that a good deed always should be its own reward. It would be tarnished otherwise. He did not want his gifts back; however he wondered if he would ever again truly recapture joy in his life. He thought he had done so this evening, but it had been a fleeting thing. Disheartened and thinking of his brother he sobbed himself to sleep. I’m always a bit sad this time of year. Scouting for the most part has ended for the term although a few camping trips may be scheduled. But as we all know it never really stops, it’s more of that deep breath we take before we leap off into another new Scouting year full of adventure. It was also the time of year that a Scouting role model of mine was called home. I’m sure that I could easily fill a post about him. He lived both the law and the promise to the fullest and always thought of the “kids” first. I wrote this story for another of my blogs (non-scouting) and while I was thinking about Skip today I felt it was right to share it with the scouty (I like this word) folk that may happen to stop by. Sun sets, curtain rises. The evening’s entertainment is about to begin! It’s a beautiful night to have a fire. 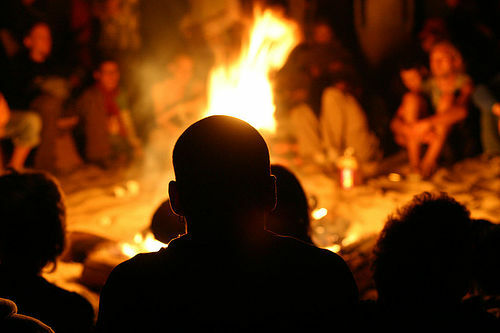 There is a bit of a chill in the air, and as a result the fire circle has pulled in a bit closer to be nearer the warmth. This is my favorite time of a Scouting event. Though tired from a long day, we have gathered around the flames to share a few laughs and stories before turning in. On the far side of the circle an older Scouter coughs. As the chatter stops and all eyes turn towards him, he stands. The storyteller has decided to take us on another adventure. I want you the think back to a time when the world was healing from a war. The world was different then, for a boy growing up in a city in Britain. The subject of our story had been apprenticed to a trade and worked long hours learning the skills that he would need. He was a lad, just turned 16 and he always did his best and never complained about the time he spent toiling in labor. While other boys his age played football or cricket, he gladly went about his alloted tasks. He did this because he was also a Boy Scout. It was his duty to do his best. What had started off as a pleasant ride through an early summer evening soon became anything but. A very fine mist had developed after he left the boundaries of town, and by the time he had ridden a short way he was completely soaked through. Adding to his misery, was that he was soon forced to dismount his bicycle so he could see the trail markers made by his friends. Several hours had passed and soon he was hopelessly lost in the gloom. Knowing there was no chance that he would reach camp that night , he started to search for a shelter where he might be able to dry out a bit and get some sleep. Soon a darkened outline started to form in the distance. As he made his way towards it, an old country churchyard lychgate took shape. For those of you who don’t know the word, lychgate is a small shelter built over a gate into a graveyard. It served as stopping point for a funeral procession, before it actually entered the cemetery. The coffin or bier would be set down on a stone slab, while the priest would begin the burial service. This was not his idea of a good shelter, the very thought of spending a foggy evening in such close proximity to a burial ground was enough to spook even the bravest man. But seeing that his options where nonexistent, he reluctantly stepped inside. After changing into dryer clothes, the young Scout laid his bedding on the only spot big enough. The stone slab. Pulling his covers up over his head and trying not to think about what he was lying on, he settled down for some much-needed sleep. Some time later he was awakened by a noise. Careful not to move, he cast his eyes about looking for the source. The moon had come out since he had fallen asleep, and deep shadows surrounded him. Unfortunately the darkness did not show anything. He had almost convinced himself that it was just his imagination, when he heard it again. Something was out on the road. He pulled the cover tight trying to make himself invisible. The minutes dragged by, but he dare not risk looking. Suddenly he felt a presence nearby, large and looming over him. There was a raspy breathing unlike anything he had ever heard before. Slowly, ever so slowly the wheezing drew closer to his head. He wanted to scream and flee but could not make himself move, the vision of a thousand nightmares playing through his mind. Frozen, he desperately willed whatever it was to leave, but the night visitor remained. That was when he noticed the smell. It was a rank combination of ancient soil and old beer. The creäture was mere inches away from his face now, waiting, inspecting it latest victim. Over whelmed by the foul odor and deep rasping breath, the Scout resigned himself to his doom. Drawing from a strength deep down inside his being, he forced his eyes to open to face his assailant. And the coarse tongue of the stray cow licked his face! As he speaks the last line, the storyteller makes a small lunge toward one of his captivated audience. The tension breaks with laughter as the target topples backward off his stump. He just nods and returns to his seat. The story is told. Sadly this will be the last tale I will get to hear from him. A few short months from now he will be called to the fire circle in the sky.